The SVG Group Element is a container that contains all child SVG elements defined inside of it.The SVG Group Element is defined by <g> and </g>. 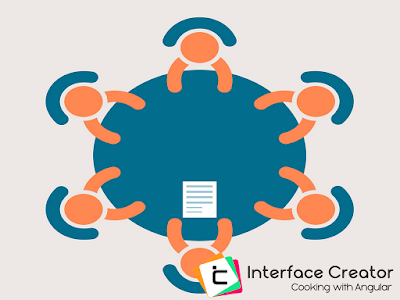 Grouping -To group a set of SVG elements that share the same attribute. Transforming - To define a new coordinate system for a set of SVG elements by applying a transformation to each coordinate specified in this set of SVG elements. For Experiment starts with 3 Red Circles and 3 blue circles. 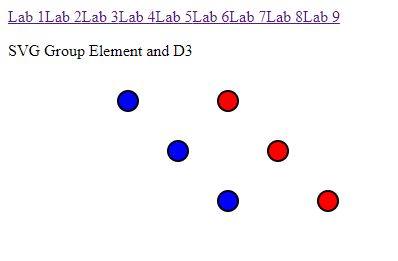 Once the above code applied the 3 circles derived from lab9databluecircle dataset & circles are created inside the bluecircleGroup <g></g> element.bluecircleGroup is a group element and it has attribute transform with value translate(100,5). so the entire group moved to the new position of x=100,y=5.